Want your content actively shared by your followers on Facebook, Twitter, LinkedIn, and other social networks? Personal Note: My business focuses on content publishing and promotion for businesses and organizations looking to get a positive return on their content marketing investment. So we’re always looking for creative, practical ideas. But, we’ve been disappointed to see how little actual data supports this slew of well-intentioned insights and advice. And that’s why BuzzSumo founder Henley Wing’s recent article on creating “sharable” content won our attention: it offers more than mere “tips” for content strategists and creators. It delivers actionable advice that’s firmly grounded in focused research — specifically, BuzzSumo’s analysis of the social share counts of more than 100 million articles over an eight-month period. The basic structure of the original article — following its own advice, as you’ll see — is a list of ten conclusions culled from BuzzSumo’s research findings along with corresponding advice designed to help you publish — then promote separately through your social media channels — content that’s shared and re-shared. We learned a lot and want to share what we took away. And we’d like to point out: Wing’s advice isn’t just for “big players” — it’s equally relevant and useful to small- and medium-sized businesses and organizations. A big thank you to Noah Kagan and his website OkDork.com, where Wing’s article Why Content Goes Viral: What Analyzing 100 Million Articles Taught Us first appeared as a guest post. What’s the effect of having just one image in a post vs. no images? 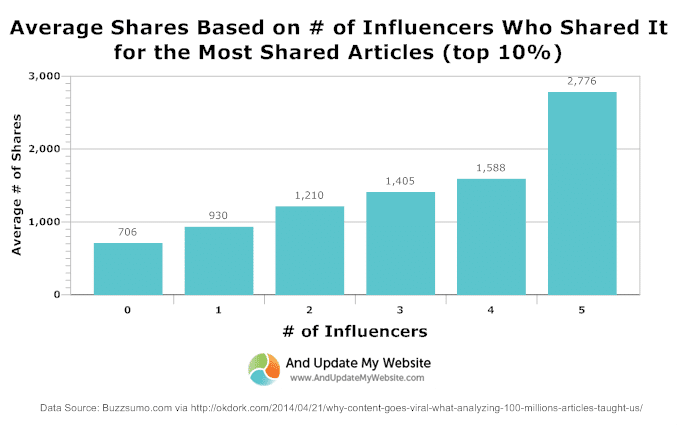 What’s the effect of having just one influencer sharing your article vs. none? How can we get readers to share our posts days and even weeks after they’ve been published? 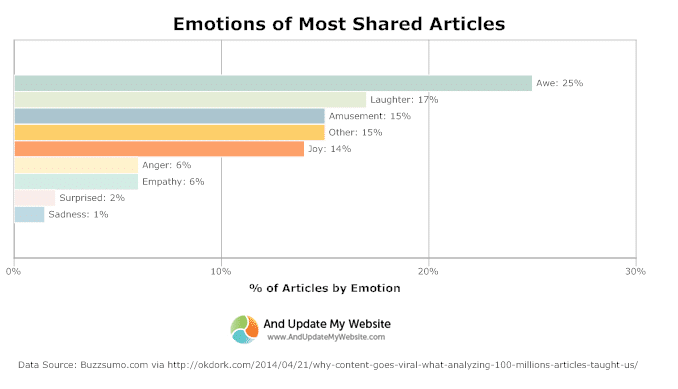 What types of emotions do the most shared articles invoke? Do readers love to share short form or long form content? What’s the ideal length? 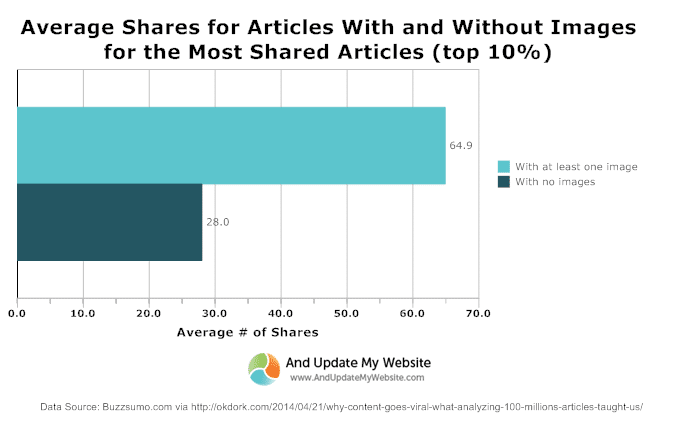 Does trust play a major role in whether an article is shared? 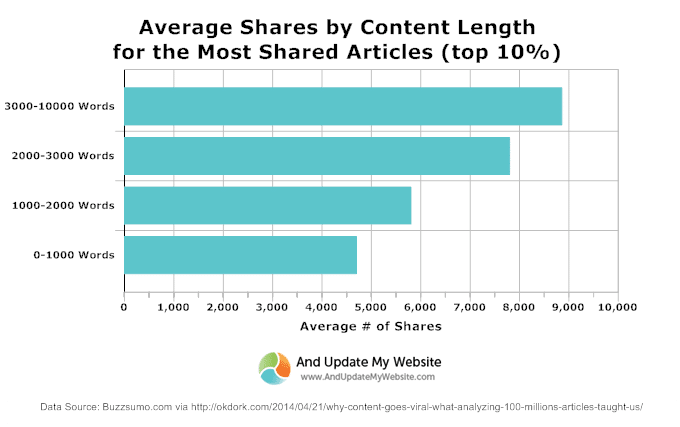 Long-form content gets more social shares than short-form content. Including at least one image in your post leads to more shares on Facebook. Including even one image in your post leads to more shares on Twitter. Sharable content invokes awe, laughter, or amusement. Sharers love lists and infographics. Ten is the “magic number” for sharable lists. 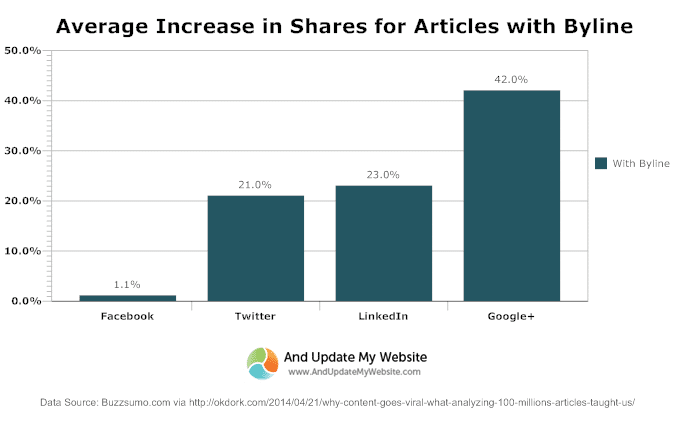 “Trustworthy” content earns more shares. One extra “influencer” sharing your article produces a multiplier effect. Repromoting old content on a regular basis increases sharing. 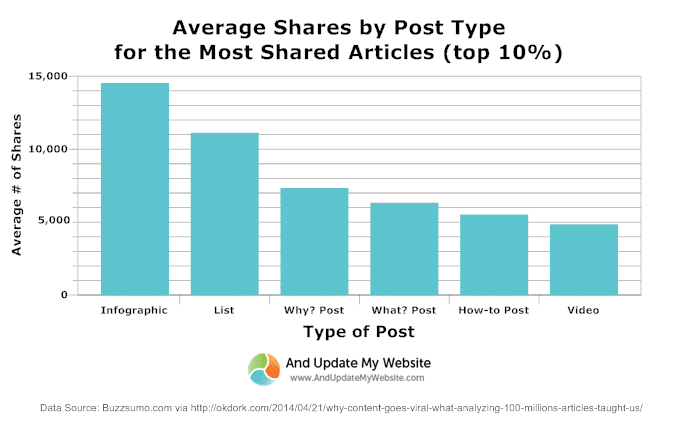 Tuesday is generally the best day to publish and promote content to maximize sharing. It’s important to understand that the BuzzSumo survey evaluated the shareability of blog posts rather than of social media posts. This means articles that are published to your website’s blog first, and are then shared with your followers through various social media platforms. This matches a content-marketing best practice: publish on your site, promote through social media. Each of the original article’s ten conclusions is reinforced with relevant, clearly presented data, and each ends with one or more useful action items, or “Key Ingredients.” Here, we’ll focus on seven of the findings with practical value for businesses and organizations. Additionally, many more short articles are published than long ones, by about 16 to 1. Looking further into the data, we might conclude that multiple shorter articles can cumulatively stimulate an equal or greater quantity of social shares. Long-form may yield a quality advantage, but Wing doesn’t discuss this. In any case, it’s probably a good idea to balance those long-form pieces with regular shorter articles that accumulate shares and also keep your “face” prominently and actively online. But keep in mind that the need for quality — compelling, informative, useful, etc. — is equally important for those shorter pieces. Take advantage of this information by aiming for at least 2,000 words per post. Longer articles do bring a social sharing advantage, and there’s another benefit implicit in this research: competitive advantage. In-depth, well-researched articles packed with insights take more time to create than do shorter, less substantial pieces. So, as noted above, the overwhelming majority of published articles are short. High-quality, longer articles will stand out on a crowded web inundated with short, frequently insubstantial pieces. And that offers a significant competitive advantage. When you create long-form content, help readers quickly scan your post with multiple short paragraphs, not a “wall” of text. One popular, effective way to do that: simply structure your post as a list. And when you’re not writing a list, stick to easy-to-read paragraphs, incorporate bullet points, and provide frequent, catchy sub-heads. And, as suggested below, punctuate your text with attractive images that illustrate or reinforce your message. The research conclusions here were unequivocal: on both Facebook and Twitter, promoted articles containing at least one image were shared twice as often as those with no image. And that’s exclusive of any control for the visual appeal of the images or the quality of the article they accompany. The impact of adding preview images was even more dramatic. Facebook-promoted articles that included a social-meta-tag preview image were shared three times as often as those without. Facebook users can and — as stated above — should add a social meta tag image to each post. Note: If you’re not familiar with social meta tags, they’re HTML-encoded “information” about the contents of a web page. They suggest to other websites how you want your content represented — for example, which image you want them to display as a preview image whenever a link to that page is posted, either by you or someone sharing a link to your page. Implement those social meta tags and add a photo to EVERY post! They help determine what web-searchers and potential readers see before they even visit your article. Adding even one image to your content and posts will double the rate of sharing on both Facebook and Twitter. Because the study didn’t compare results for articles with one image to articles with more than one, and it didn’t control for the quality of the images, we’re left to speculate. But it seems to us more than likely that multiple, high-quality images will boost sharing rates even more. Think clear, compelling, provocative, heart-warming, fun, funny, etc. Visual meta tags added to your published articles increase their reach. Whenever someone shares an article directly from your site or blog, this powerful, share-boosting preview image will be automatically added to their news feed, timeline, etc. Visual meta tags don’t have to be complicated or burdensome. Re-using one of the images already included in your post will do the trick. Your opening image might be a logical, effective, simple choice. Lists get very high marks from BuzzSumo respondents. Among six types of content included in the survey, lists were a big winner trailing only infographics. Lists were shared more than twice as much as video posts. The survey also determined which list lengths garnered the most shares. The big winner: lists with 10 items. Ten-item lists won four times the number of shares — an average of 10,621 — than did the second most popular length, 23. Lists of 16 and 24 items ranked third and fourth, respectively. So, organizing your post as a list increases its sharability. And, when you create a list post, rounding your number of items up or down to 10 is the optimal choice. Further, if 10 items is too few, you have several options. Ideally, break your post into multiple posts with ten items each. Or try for one of the other magic numbers: 23, 16, or 24. But in general, the survey suggests, lists longer than ten will gain more shares than lists of fewer than 10 items. This reinforces the earlier finding favoring long-form content. Organize your post as a list to significantly increase its sharability. Round your number of items up or down to 10 whenever possible. To determine the role trust played in decisions to share, BuzzSumo compared the share rates for posts containing either a byline or an author bio with the rates for posts containing neither. The results showed a definite benefit produced by bylines and bios. But they also revealed some interesting differences among the social networks. The presence of a byline or bio significantly increased sharing rates on Google+ (+42%), LinkedIn (+23%), and Twitter (+21%), but had virtually no effect on Facebook shares (+0.10%). Unsurprisingly, the higher the stakes, the more trust matters. And because it matters, we must all do what we can to create trust in our published content and to expand and maintain that trust. Remember to have a byline at the beginning of every post and a bio at the end. Your content may not look trustworthy if you don’t. Adding a byline and bio to all of your posts is very easy to do — almost every blogging platform has this functionality. So it’s a pleasant surprise that it yields relatively good sharing rate increases on professionally oriented social media. Establish and reinforce your credibility. Include an appealing thumbnail photo with your bio. Set up Google authorship for yourself and your associates, and link your published posts to your Google+ profile. It’s an effective way to increase the level of trust inherent in your byline and bio — and, since Google is the most-used search engine, it offers SEO benefits, too. Here’s one source of information about Google authorship. Broaden and strengthen your online connections. Maintain an active online presence. Don’t just “Like” another post, offer a useful or insightful comment or express praise. Include curation of other authors’ works in your publishing activity, and offer a brief but thoughtful original response to each. 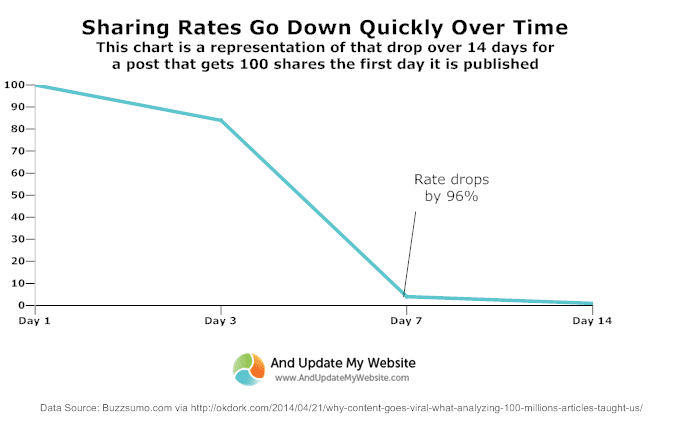 You’ve probably noticed that the social sharing rates for your content generally spike in the few days after you first promote it through social media, then drop off significantly. After three days, the number of shares dropped at least 96% for the following four days. After the first week, the number of shares dropped at least 86% for the next three weeks. Some articles, however, were able to buck this trend. Looking further, researchers found that these happy “anomalies” most often occurred when the article was repromoted weeks after the initial promotions. This finding offers a self-contained win-win-win situation. By reintroducing older-but-still-relevant posts you will achieve a number of benefits. You’ll not only stimulate more immediate social sharing of your content, but you’ll earn new audience for your still-valuable content. You will also generate more online activity with very little effort and cost. Make it a practice to repromote your articles through social media a week or so after the initial promotion. When events or holidays are coming up, find relevant older content and share it again. Repromotion seems obvious, but very few people do it. 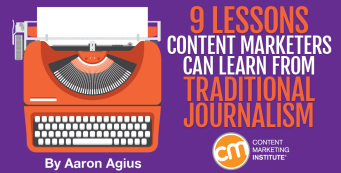 There’s such a push to create more content — rather than to get the most out of your existing content — that once an article is published, it’s quickly lost in the rear-view mirror. Re-promoting existing content can make a big difference in the overall return on your content marketing investment. No matter how busy you are, repromotion means you can always find something valuable to quickly recycle, either in its original form or in an easily spruced-up edition. BuzzSumo analyzed the 10,000 most frequently shared articles, and mapped each one to an emotion, such as joy, sadness, anger, amusement, and laughter. They found that the best share generators were positive emotions like awe, laughter, and amusement — in that order. Negative emotions, like sadness and anger, still increased shares, but less effectively. Be entertaining…nobody wants to bore their friends. Quizzes work…people share content that helps them identify who they are. Have an opinion…being controversial may divide the crowds, but those who agree with you are more likely to share your content. Thanks to BuzzSumo, we now know that it’s not only unnecessary to be overly formal when you write for publication — it’s counterproductive. So live a little! Wear your heart on your online sleeve. Show your human side, your humorous side, your compassionate side. It’s not embarrassing. It’s not unprofessional. And it’s not just cathartic. It’s effective content marketing. Every published (or hopeful-to-be-published) author in the US, dreams about the “magic kiss’ of an endorsement by Oprah Winfrey; inclusion on Oprah’s Book Club List virtually guarantees that any frog of a book becomes an overnight Prince Charming, elevated instantly to book-sales royalty. It’s the paper publishing equivalent of internet virality, and offers a clear lesson for content marketers: get influential people to share your content and you’ll reap a bumper crop of social media benefits. How to pull this off? BuzzSumo’s Wing proposes a “work backwards” approach. Choose a topic you want to write on. Using a tool like BuzzSumo’s Top Content Search, find other articles written on the same topic and identify the “influencers” who shared it. Choose a few and start cultivating a relationship with them (before you post your article). Ask them for a quote for your article. Cite or link to one or more of their published works. Involve influential people in your content creation to significantly increase your sharing. Don’t just focus on the “biggest” names or “top” influencers as they may be less likely to respond until your audience is larger. There are many more “smaller” influencers, including many eagerly looking for opportunities to contribute. Put the “six-degrees-of-separation” effect to work: look for areas where an influencers network may overlap with yours, identify mutual connections, and ask them for an introduction. Offer reciprocity. Engage your target influencers by reading and commenting on articles they’ve written or contributed to. Turn yourself into an “influencer” for them. Relationships with influencers can happen offline. Think about local influencers. Identify people in your community who are influential with your target audience and cultivate relationships with them. Invite them to coffee or include them on a guest list for your next no-host or hosted event. It All Begins and Ends with Quality Content. Many of these share-generating elements — like including images and writing longer, more substantial pieces — are simply standard ingredients of quality content. Even your most brilliant article will fail to reach a wider audience if it’s not redistributed by your readers. And even the most shared content will fail if it doesn’t represent you well and offer your readers something they value. Of course, thanks to BuzzSumo’s research, we can all now begin to define what readers value and what motivates them to become sharers. And that knowledge can guide us to create content that’s both high in quality and shareable in effect.